Quids in! was launched in 2008. The magazine helps people on low incomes find ways to make their money go further. We wanted to help those being targeted by loan sharks, high interest lenders and rogue traders almost always preying on estates already burdened with debt and limited access to free-to-use banking facilities. Since Quids in! started the world has changed. Poorer paid employment, cuts to benefits and rising prices add to the pressure on households struggling to keep their heads above water. Unlike other magazines and websites, Quids in! is here for people who don’t have so many savings to fall back on or investments to worry about. It’s for real people: for those who are feeling the squeeze and ‘Just About Managing’ but also for those who feel they are one pay cheque or benefit payment away from disaster. The idea is to provide info that people want to read, so we produced a glossy read that mixes celeb interviews with easy-to-follow news and advice about money matters. More recently we added a monthly money email service, the Quids In Readers Club, to our services. Quids in! was founded by Jeff Mitchell, a former Managing Director of The Big Issue. Jeff also runs Clean Slate Training & Employment, a social enterprise that creates and supports paid work for people facing barriers to the jobs market. In 2001, the Social Publishing Project (SPP) was created as a not-for-profit home for Quids in!. 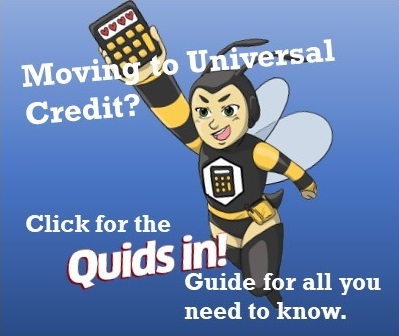 SPP also produces other publications, such as a guide to Universal Credit, a New Tenants Guide, homelessness guides and websites for other community projects. Help is not around the corner. More than ever, people in with money troubles will need to take control for themselves. The help they’re more likely to be offered will be from high cost yet legal money sharks, like payday loan companies and high-interest lenders. Quids in! magazine and this website aims to help readers help themselves.